Posted 30 January 2019. PMN Crop News. University Park, Pennsylvania (December 13, 2018)--With early hay feed out in Northern Pennsylvania this winter, many producers are already asking how they can stretch their hay reserves. The short window to make dry hay was of no help, locally. Below we review techniques many fellow producers are using to help their hay storage last the winter. Here in Northern Pennsylvania we have had snow cover and temperatures kept forage in good condition. Hay fields that were not able to be harvested, are now being grazed by cattle and sheep that can nose under the light snow to access high quality forage. There are several hay feeder options available with different benefits. A group of hay rings called �hay conservation feeders� and �slow feed nets� for rounds are a newer technology embraced by some producers to reduce waste when livestock pull hay through the ring. A study at Michigan State University Extension looked at waste differences in Hay Feeder Design between Cradles, Trailers, Rings and Cones. Cones were most efficient with Rings taking a close second. University of Minnesota Extension has an article �Feeding horses with a Round-bale Feeder� that describes a 2010 study showing various feeders and efficiencies with horses. Remember to move your hay feeder around if you are feeding directly on the ground in crop fields or pastures. Consider feeding indoors or in a bunk to help reduce hay trampled and waste. Reducing access to hay by just a couple hours a day can increase efficiencies. Furthermore, the most hay waste is found when feeding more than a one-day supply. This can be difficult to manage from a feeding perspective. A similar article �Reducing Losses when Feeding Hay to Beef Cattle� by University of Missouri Extension reviews these concepts. This year might pay in some areas to utilize other resources on the farm, such as grazing corn stalks, straw and other supplements that meet the nutritional demands of your livestock. The easiest way to manage hay supply and reduce winter feeding costs is to grow more forage by rotational grazing or growing short season forage crops that can be ensiled or grazed later in the winter or early in the spring such as rye or triticale. Likewise, reduce hay feeding in summer, by planting a summer annual such as sorghum-sudangrass that can reduce or eliminate the summer slump. This year even hay stored in drier locations away from trees are experiencing significant spoilage. This is always reduced by covering bales and storing off the ground where possible. Remember, a tight bale will shed moisture better. 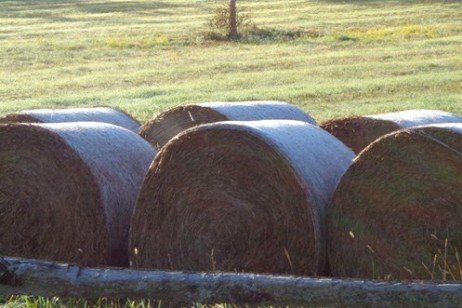 Act now and plan for next year to reduce hay waste and stretch your winter feed storages.